Danceworks and the Wisconsin Center District have announced a new partnership to bring Danceworks Mad Hot’s two yearly Competitions to the UWM Panther Arena starting in the 2018-19 school year. The Wisconsin Center District (WCD) and Danceworks, Inc. have announced a new partnership to bring Danceworks Mad Hot’s bi-annual Competition to the UWM Panther Arena. 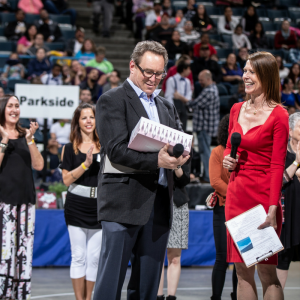 The announcement follows a successful Mad Hot Ballroom Dance Competition on Saturday, May 19, the culmination of a 12-year partnership between Danceworks and the BMO Harris Bradley Center. UWM Panther Arena will begin hosting Danceworks Mad Hot Competitions twice yearly starting in the 2018-19 school year, with the Danceworks Mad Hot Tap Dance Competition in early 2019. Danceworks will release event information at a later date. For more information, keep checking the Danceworks, Inc. website at www.danceworksmke.org.